Thank you to The Quaker Oats Company for sponsoring this post. As always, all opinions are my own. As life has gotten busier, having a streamlined morning routine has always been something that was important to me. I certainly didn’t want to skip out on breakfast just to get some extra sleep, but I also didn’t want to waste that precious sleep time by being really inefficient in the morning, either. 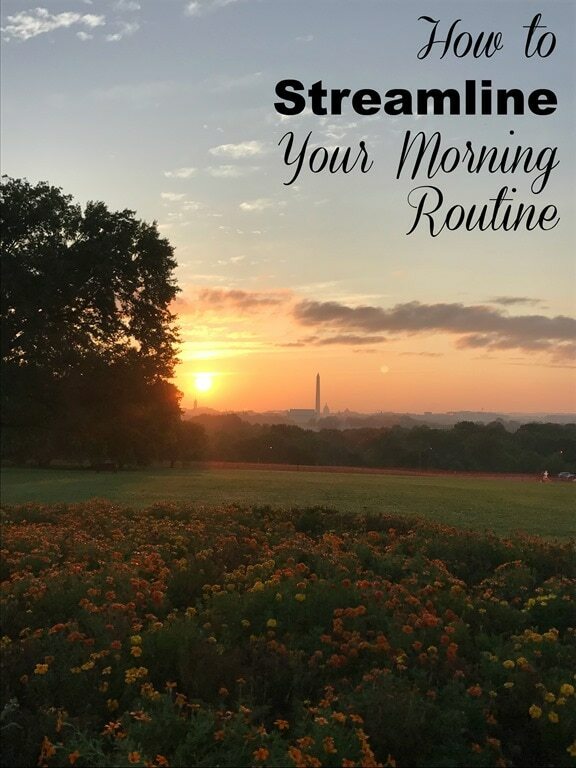 Here are some of the ways I’ve worked to streamline my morning routine over the years. What are yours? I’d love to hear some new tips! 2) Don’t wash your hair every day. Obviously this one depends on whether you have hair that’s amenable to skipping some washes, but washing my hair every other or even every 3 days saves me a TON of time, especially since I have really thick hair that takes ages to wash. I generally try to plan super sweaty workouts (or swim workouts) on days when I know I was going to be washing my hair anyway. Dry shampoo helps a ton with this, too – it’s a lifesaver, especially if I’m on day 3. And then there’s also always the “toss your hair in a bun and move on with your life” approach, too. 3) Don’t blow dry your hair. This is another thing that saves me a TON of time – I used to blow dry my hair every single day when I was in high school and throughout most of college. Now I have a haircut that makes more sense for air drying (yay layers), and I have discovered that if I don’t brush my hair once I’m out of the shower (I only brush it in the shower) and just scrunch and let it air dry, it’s fine. Yes, it’s annoying to have wet hair when you start the workday sometimes, and I’m lucky that I have a career that is okay with wet hair. But this combined with #2 saves me a ton of time. I do curl my hair sometimes, but it only takes me 5 minutes (vs. 30 to 40 minutes to blow dry). I have to do the curl when my hair is dry, though, so often I’ll pack my curling iron in my work bag and do that once I get to my co-working space and my hair is dry. 4) Select a breakfast option that is easy. This can either be done with some meal prep/making recipes ahead of time (see also my post on Tips for Super Fast Weekday Breakfasts), or by simply finding breakfast options that take no time at all in the morning, like Quaker Overnight Oats. You can read more about the Quaker Overnight Oats in my original blog post about them, but all you do is pour your milk or non-dairy milk of choice in the night before, put the container in the fridge to cold-steep overnight, and then it’s ready to eat in the morning. 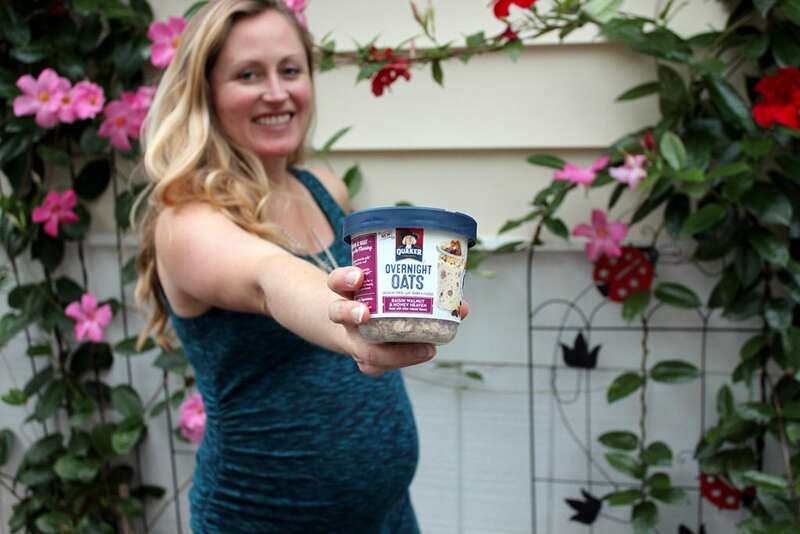 Made with 100% whole grain oats, quinoa, and flaxseed, they’re a good source of dietary fiber and they have no artificial flavors or added colors. My fave flavor is the Raisin Walnut & Honey Heaven. Having a breakfast choice already prepped and waiting saves SO much time in the morning! 5) Pack/lay out clothing the night before. On days when I’m doing an early morning workout in the city, I will pack my bag the night before with a change of clothes, my toiletries, my laptop, any nutrition client files I might need, my planner, etc. That way in the morning all I have to do is throw on some clothes, have a snack, grab my bag, and go. 6) Pack lunch the night before. If you’re a fan of packing your lunch, I highly recommend packing it the night before so you don’t have to deal with it in the morning. Same with snacks – just get it all ready beforehand so you aren’t scrambling when you are trying to get out the door. 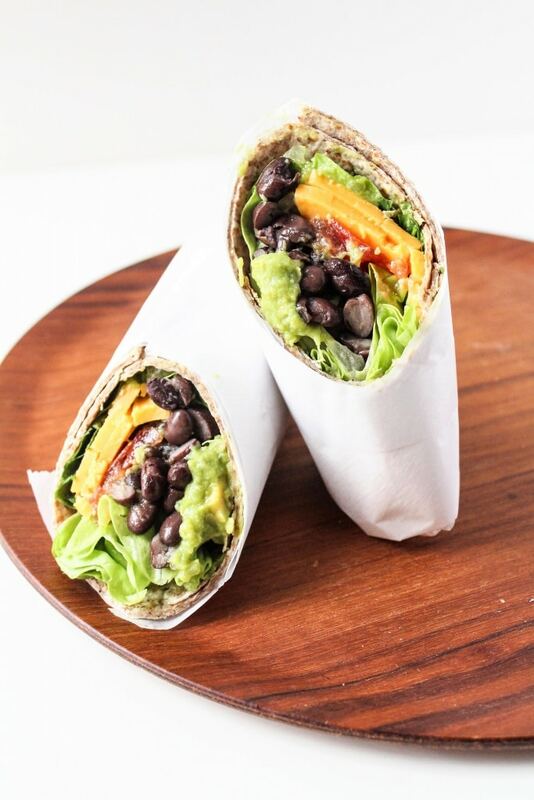 For some easy lunch ideas to pack the night before, check out my Mix + Match blog posts featuring Easy Sandwich Recipes and Grain Salad Bowl Recipes. How do you streamline your morning routine to save time? The “throw you hair in a bun and get on with your life” only recently entered my own life! I can’t believe I hadn’t been doing that before. It was so funny, too, because ALL of my coworkers commented on how elegant my hair looked the first day I did it. (WHA??) Little did they know I had not washed or brushed it that morning. So easy! I SO wish I could get by with not washing my hair every day, but unfortunately I have SUPER oily hair and no amount of dry shampoo will allow me much more than one skipped day! However, that one skipped day is pure GLORY!! Oh man, that’s a bummer! There’s always the dry shampoo and bun situation… or a fun braid. :) Braids hide dirty hair well! I’m in the same boat as you! Have you tried the Living Proof Dry Shampoo? It’s the only one that will work for me. I can’t use it on days I want my hair to look really nice but it keeps my hair from getting even more oily or greasy on days I’m good with a bun or pony. I actually haven’t tried that one, but I will now! Thanks so much for the recommendation! I put out all workout clothes (underwear, socks, pants, even jacket) the night before in the order that I will be putting them on. It requires a lot less thinking as does having my water bottle filled the night before. And I agree packing lunch the night before, I put it in my lunchbag in the fridge so it’s the only thing I need to grab besides a cold pack, is a huge timesaver. That’s a really good idea… I should lay out my workout clothes the night before, too (rather than just packing my toiletries and change of clothes for later) – and fill the water bottle! On packing your lunch the night before…. since my husband and I usually have leftovers for lunch I pack lunches as I am cleaning up after dinner! That’s very smart! I wish Matt liked leftovers… it makes batch cooking harder! I also never dry my hair. In fact, I just wash it at night and air dry it in a bun as I sleep. Have you tried the air dry stylers (Bumble & Bumble)? I find they really make my air dried hair a lot nicer. I haven’t, but I will have to – thanks for the tip! Limiting the hair washing definitely saves time. I have totally debated whether or not a specific workout was worth having to wash my hair after. Haha so have I! I also try to plan really sweaty workouts (or swim workouts) on days when I know I’m going to be washing my hair anyway. What are your thoughts on the amount of sugar that are in those quaker oats? I would love to make my morning routine a bit quicker by using those ready-made oats from Quaker, but all of the ones that I’ve seen in the store contain quite a bit of sugar. As a dietitian, what is your take on the amount of sugar in those breakfast bowls? Isn’t that the same is eating a bowl of fruit loops? Love your blog! Hi Nicole – great question! The sugar content was one of the first things I looked at when I was offered the opportunity to try this product, and I didn’t think it was too high, especially since there’s a decent amount of protein (9g) and some fat in the mix to buffer the sugar, too. I calculated the grams of sugar in the oatmeal I normally make for myself (my microwave banana oatmeal with rolled oats, milk, 1 whole ripe banana, berries, cottage cheese, etc. ), and it’s actually higher because of all the fruit I add in! So, I’m okay with it, but I totally get that some people are not, and that’s okay too. Thanks for reading! I actually cut my hair from below the shoulder to short to save time in the morning! Luckily I had it short before and loved it, so it wasn’t a massive risk! I have really thick hair, so washing and drying daily was a real chore. Now with a good cut it literally blow dries in 2 minutes! My other key thing for saving time is making sure I put everything away in the same place each day when I get home, so that in the morning I don’t have to think – I can grab everything and go. I sometimes think I should just chop off all my hair – would be so much easier! My hair is really puffy if it gets too short, though – I don’t think it would be a good look for me. :) Good tip on keeping things in the same place, too – the rare time that my keys are not on their normal key rack by the back door I’m so stressed trying to find them and rush out! These are great! I used to wear my long hair in a bun all the time, but I eventually decided I was done with that long of locks. I had my hair cut into a pixie ‘do May 2013 and have never looked back! I do have to wash it daily because the product I use can really give me some fab bed-head, but it’s so much quicker to dry and style. I pack our lunches and snacks the night before, which is a huge help. Great post, Anne! That is so awesome that you can curl your hair in 5 minutes! I have very straight hair and it takes forever. What curling iron do you use? I have this one (1 inch version) and love it! Isn’t it incredible how laying out your clothes the night before makes such a difference? It seems like such a quick and trivial task but when they’re actually ready for you in the morning it saves you a lot of time. How I wish I could get away with not washing my hair every day! If I don’t wash my super fine hair every day, day 2 is effectively the grunge look – stringy, greasy, and just plain gross! The only thing that helps on those days is a hat – which doesn’t work in the office. Have a great day!! Bummer!! Fine hair is definitely tough with the no wash – mine is much more coarse!